How to make sure the molecular is what you want? Most of products have the similar color. Some of them, especially those supplied in small quantities or as lyophilized solids, may be difficult to visualise. These products may appear as a clear, thin film on the bottom and walls of the vial. It is difficult to identify them with appearances. For chemicals, the determination of the structures is carried out mainly by spectroscopic, such as Infrared spectroscopy (IR), Mass Spectrometry (MS), UV-VIS spectroscopy (UV), Nuclear Magnetic Resonance spectroscopy (NMR). NMR and MS of them is the most commonly used method. 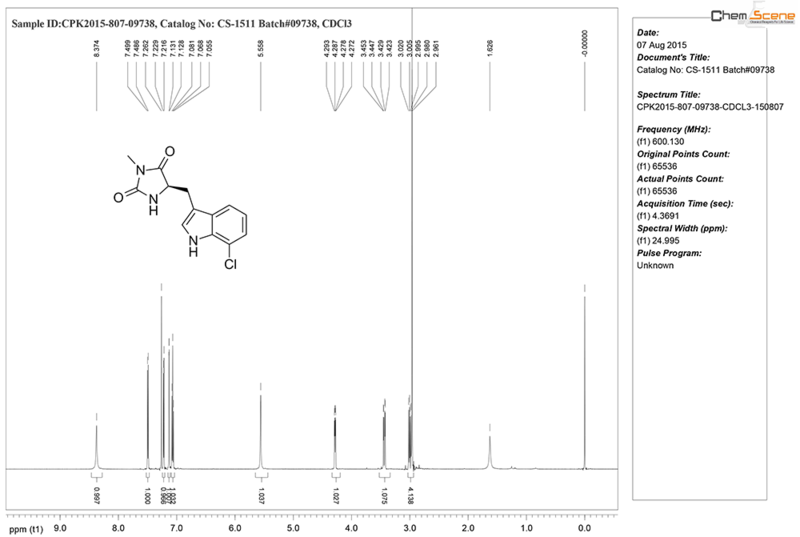 C’ products had identified through NMR and MS. Our customers can find the conclusions of identification in Certificate of Analysis (COA) on line. The NMR and MS are attached for our customers to the shipment. Specific analytical methods also can be requested from our Technical Service group. Eg. 1H NMR Spectrum of CS-1511 . Eg. MS of CS-1511 . Eg. COA of CS-1511 . How do you detemine the purity of products? For a biological experiment, the purity of inhibitors is a key to success. From the NMR and MS, our customers can get the information of structure and the approximate purity. It is not enough. The High-performance liquid chromatography (HPLC) is a powerful method which chemists routinely use for purity checking. The purity of each chemscene's products is available online in COA. The HPLC is also can be found for our customers in the shipment package. What’s the HPLC Eg. HPLC Spectrum of CS-1511 . The separation of chiral products has been of great interest because the majority of bioorganic molecules are chiral. Chirality is a major concern in the modern pharmaceutical industry. This interest can be attributed largely to a heightened awareness that enantiomers of a racemic drug may have different pharmacological activities, as well as different pharmacokinetic and pharmacodynamic effects. Measurements of enantiomeric excess (ee.) by chiral HPLC are quick and accurate, although chiral stationary phase may only work for limited types of compounds. Chemscene provided chiral purity information online or in COA for each batch of chiral products. The spectrum is available with other analysis reports. What’s the Chiral HPLC Eg. Chiral HPLC Spectrum of CS-1511 .